In May 2014, I posted a review on HubSpot’s Marketing platform. The review was the culmination of several months of testing and discussions with HubSpot staff. Since I approached it as a competitor to Marketo, my recommendation was to stick with Marketo if that’s what you were using. [Updated June 26, 2016 with new links]. I stand by that recommendation. In the past 18 months, HubSpot has shifted to become a Sales and Marketing platform firm for very-small businesses to SMBs. This change indicates that HubSpot is less interested in the SMB-Enterprise segments where Marketo and Eloqua are dominant. In this updated review on HubSpot’s Marketing platform, I will go over a few of the things that have changed and which type of firms may benefit. One of my gripes with the last version of HubSpot was the interface, especially the lack of a good user interface for files and Campaigns/Workflows. While the Campaign interface still lacks good visibility, the Design Manager is much improved. File Manager – now you can easily upload files and manage domains if you post files for download. You can even archive older files without losing data. Tabs – this new feature seems like a way to view and manage multiple templates. CSS Files – this is a much improved method of controlling one or more layouts. Marketo could definitely use this. 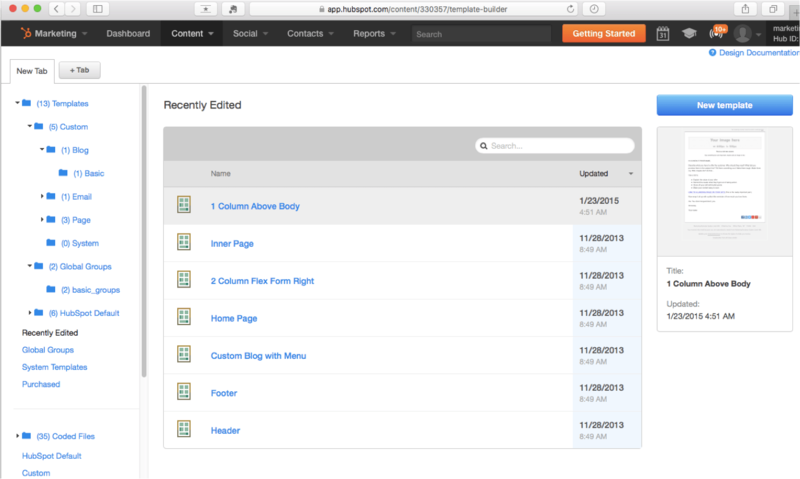 Template Creator – akin to Marketo’s Guided Page Templates, HubSpot offers an easy to use Landing Page Template creator. I came across the new Workflow system. In HubSpot, Workflows are distinguished from Campaigns, even though they are similar in function. The changes appear to be mostly at the Smart List level, allowing the user to more easily select groups of leads on a behavior basis. There are also more Flow Actions available. In many ways, it does make sense to differentiate workflows from campaigns, however, I tend to think of a workflow as any set of steps from an email to a data change…but that’s just how Marketo works too. As of today, the Beta Workflows are available to Professional or Enterprise customers or members of the Beta Program. In my original review of 2014, HubSpot had API capabilities, but few native connectors. In fact, Salesforce syncing was limited and not native at all, in contrast to major competitors. At the end of May 2015, HubSpot announced a new partnership with Salesforce to continue their work together, despite competing in the lower end of the MAP space. It turns out that only 20% of HB customers use SFDC and many more use no CRM at all. (Clearly a reason to build HubSpot CRM, no?). A native SFDC connector was not high on the priority list until this year. The good news it does exist now. What does HubSpot’s SFDC connector have and how does it work? Bi-directional sync, which Marketo, Pardot, and Eloqua users enjoyed for years. You will note that the HubSpot interaction area, akin to Marketo Sales Insight, looks just like the native HubSpot Timeline seen in the MAP and CRM tools. To me, this is a real visual leg up on the competiton for Sales. Field Support – it appears the sync covers all of the data fields you would expect. API Call Limit – HubSpot estimates 4 per lead-day. Behavioral Activity Sync – yes, just like in Marketo, although it only covers Form and Email Opens. 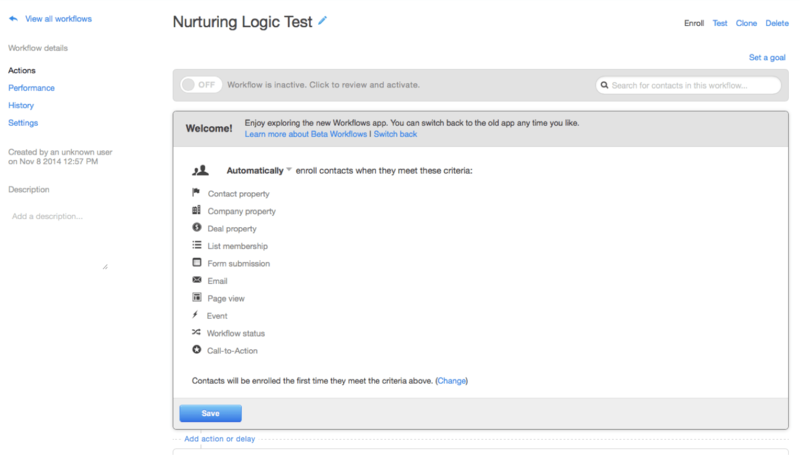 Sync Control – you can use a smart list to select leads at a Lifecycle Stage or just sync everyone. This is interesting because it is a part of the setup process instead of the usual Lifecycle system setup in other tools. Integration Test – the wizard even encourages a test and final sync. From the docs, it appears to be a solid SFDC integration process. Marketo users will find a couple of interesting differences, including clear Sandbox support and clearer Account and Opportunity sync, although I am not clear how bi-directional those objects are. HubSpot has a strong marketplace as well for other integration needs as you build your stack. How does HubSpot Compare to Other Tools? It is harder to compare each MAP firm as most now target certain size companies and have evolved to solve slightly different sets of marketing problems. Sirius Decisions did a quick summary in 2014 that may be helpful as well. Since I have yet to personally experience the latest SFDC offers here, I can only compare on feature sets. My expectation is that Pardot’s capabilities are aimed at the lower end of SFDC’s customer base while they figure out how to compete with Eloqua and Marketo on something other than price. I continue to hear SFDC pressuring smaller firms to switch to Pardot, using package pricing as the key lever. Should a HubSpot user switch to Pardot? I would say no, because of the loss of features and the cost of switching. HubSpot may experience competition in that 20% of their base that uses SFDC and any customers that grow to a point that SFDC is an option for them. Firms that rely heavily on SEO will want to stay with HubSpot. Firms that are looking for more automation and reporting will lean toward Salesforce or Marketo. InfusionSoft has emerged as a powerful automation platform for Pro-Bloggers and certain small businesses. The system is designed to support ecommerce, such as web businesses selling products or information products, InfusionSoft has a lot to offer. I do not see HubSpot competing directly with InfusionSoft except with firms still in the education phase of what they need. I recently came across this firm and found their platform covers many of the key MAP features. This may be an alternative to HubSpot and Marketo for smaller firms. Curious if anyone has experience with Maropost, let us know below. Act-On’s feature list reads like a list of complaints about Marketo. Indeed, the G2Crowd rating now is neck-and-neck with Marketo. While I haven’t used the system in a long time, the site indicates to me that the tool has much improved in capabilities. I would say Act-On claims a spot somewhere between HubSpot and Marketo and competes more directly with Pardot. It would be interesting to hear from anyone who has used Act-On and HubSpot and/or Marketo. Update (Dec 29): I had a brief demo of the latest Act-On system. While they made the same claims about being up and running in 45 minutes, they did admit that the Time to Value is about 90 days. What did impress me is the tool covers key workflow issues out of the box as features, instead of asking the marketer to figure it out. 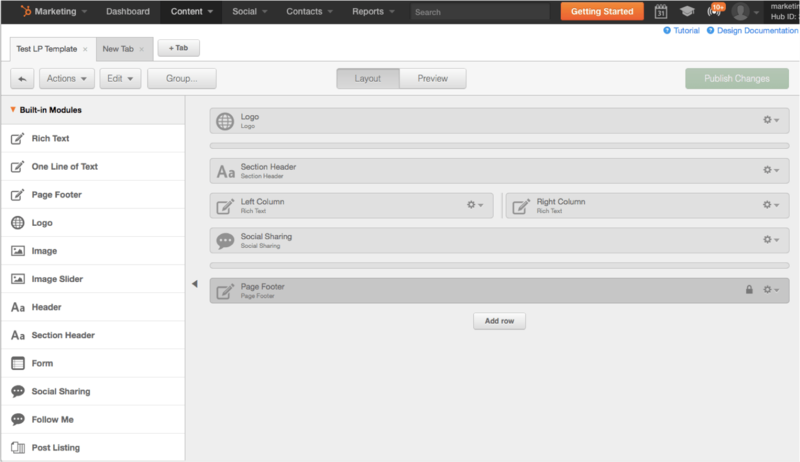 For instance, RSS-to-Email and Subscription Management are listed features and easy to customize. Scoring is also a customizable walk-through instead of something to build. Act-On claims this is the result of trying to help marketers focus on the big goals instead of complex operations setup. Even the lead detail view is a clean view of touches (although not quite a timeline) rather than a database listing. The toolkit also lets marketers focus on Outbound vs. Inbound issues along with asset building. For marketers at smaller to medium firms lacking a marketing operations function (or skillset), Act-On could be a good entry point vs. Marketo or Pardot. The development team has clearly improved since 2012. I continue to hear about firms moving from HubSpot to Marketo or Pardot to Marketo once they reach a certain size, or maturity level, in the use of their MAP. Marketo lacks a few things HubSpot has: integrated SEO and Keyword suggestions; CTA module; robust interface for dynamic content; a timeline tool; and the asset builder. Marketo, however, is far more robust on workflow; marketing attribution, organization of the system; and lead nurturing. It is more purely a MAP than HubSpot, since HubSpot has added sales and CRM tools to meet their smaller sized customer base. Thus, for SMBs through Enterprise, Marketo will continue to be the best choice for building a constellation martech stack. Is that bad for HubSpot? No. Now that HubSpot has fully embraced smaller firms, their system will reflect those needs more and likely shy away from being a platform rather than an all-in-one solution for small business. If one of their customers is successful and grows into a medium firm or enterprise, I would expect them to migrate to a different martech stack altogether. If you are looking for a new vendor or making a case to switch (or stay put), take a look at my Marketing Automation RFP and SBI’s Vendor Scorecard. Sirius Decisions’ latest overview may also help. First, the updates to HubSpot make the system a more complete small business marketing platform, especially with the integrations to other CRMs as well as HubSpot CRM. The workflow and guided template tools are welcome upgrades. HubSpot’s asset builder continues to outperform every other product out there. Marketo has Guided Templates now, but HubSpot has truly created a system to build templates, rather than just install them. For a VSB, this ability is likely a major difference and time savings instead of hiring expensive designers. Should HubSpot spend a lot of time on that area? Hard to say for sure, but I suspect their targets love it. Calls to Action – this module shows you exactly which CTAs exist, how they are doing, and where they live. This is just not possible in other systems because the CTA is part of the asset (Email, Page, etc) instead of a separate asset like it is in HubSpot. SEO – this tool has been central to HubSpot’s story and inbound methodology. It is true that other MAPs do not provide direct, in workflow advice on keywords, nor do they natively report on such data. Is this a replacement for a massive 150MM page site and the power tools for it? No. Is it amazing for a VSB or SMB who rarely looked at SEO before? Yes. I’ve said before that the ROI of marketing automation is in time saved, especially in the first year. I’ve also said as your use of the MAP improves, the next ROI is in transparency, because you can now improve allocation of resources across the funnel. HubSpot now has an ROI page on its site. The challenge with ROI of any tool is correlation vs. causation. Is using HubSpot (or another MAP) actually encouraging you to do more simply because you now have a daily control panel for your marketing? Could that actually be the source of the increase? Do marketers do more because they feel they have to justify the thousands of dollars they are spending, and thus create the ROI themselves? HubSpot and MIT Sloan claim “72% of customers saw an increase in sales revenue within one year” and the average increase in list volume was 4.77x in one year. While I have no reason to challenge the data, I wonder how much of the change is caused by a mindset vs. the actual software? Each application, and especially MAPs, have a worldview that forces the marketer to adopt that model of the sales funnel for their daily activities. If you adopted the inbound-funnel mindset without HubSpot, would you see similar results? If you chose Marketo and Pardot’s demand generation approach, would you see similar results, or different ones? At one firm, I doubled blog visits in 3 months with regular content, but I did not need HubSpot to achieve that. Organic Traffic Growth in 1 year – 590% vs. 170%. B2B Lead Generation – 125% more leads with HubSpot. Conversion Rate (B2B) – 43% more. While the numbers sound impressive, this is a flawed study. The sample was 14, which can never be statistically valid given that HubSpot has over 10,000 customers. As I mentioned earlier, is it the tool or the fact that the marketers could do more or were “forced” to do more because they had this tool? Neither this study, nor the MIT Sloan study explain this correlation question. Either way, HubSpot and MAPs do have an ROI. The MAP itself does not generate anything – it’s always up to you. Most firms fail when they do not prepare their business process to match the tool, or vice versa. HubSpot will continue to dominate the smaller firm segments, while Marketo and Eloqua continue to dominate the larger firm sized segments of the market. While Marketo Spark and HubSpot compete, I suspect that is happening only with firms at 5,000 to 30,000 contacts or high growth startups. In other words, if you are using Marketo today, stay there. If you are a VSB, you will likely find HubSpot to be a good fit, or possibly Pardot. As HubSpot becomes a VSB revenue platform, the bifurcation of the marketplace will be more obvious, leaving an interesting gap for competitors. Disclosure: I had a free trial to HubSpot Marketing, CRM, and Sidekick. I was not asked by HubSpot to provide this review. We are currently moving to Marketo because we require more enterprise-level functionality. I would agree with just about everything you’re saying. Hubspot is great when things are still simple (as they prefer to be). Thanks Josh – this is really useful. After being a Marketo certified power-user for the past 4+ years, I am now working at a very small technology startup. We don’t have a true MAP in place yet, but using a tool called Orbtr that plugs in to our WP site. It doesn’t really do much that is of use except web site tracking, to be honest. We use SFDC for our CRM and stand alone email solution for the time being. I’m definitely missing many of the features I was used to in Marketo! Unfortunately Marketo is very pricey for a company our size so I’ve been looking at Hubspot as a potential MAP in the 2nd half of 2016, but also interested in Pardot and Act-On. I appreciate your staying on top of all the changes for the rest of us! Glad to help. Let me know what you think of the other tools if you go forward. 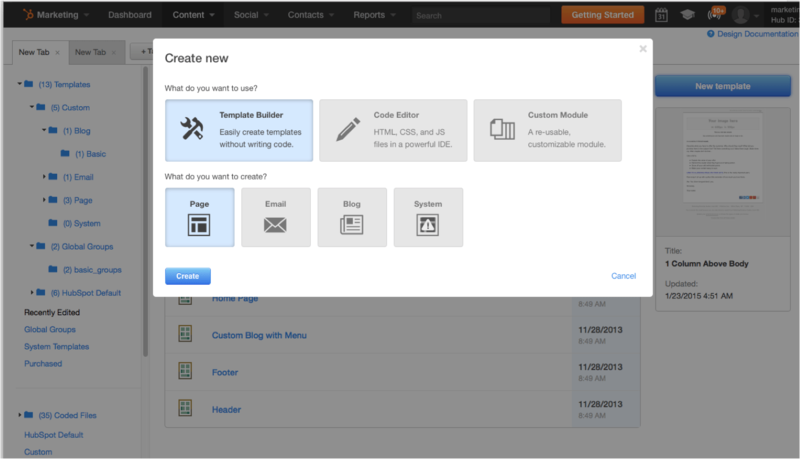 1) The Hubspot SEO functionality is far ahead of most tools. Specifically their COS loads faster than anything else I’ve used, and the pages are responsive out of the box iirc. These two factors are key to ranking. This is more than just a magical tool for SMBs. 3) Platform vs all-in-one. Although Hubspot has built a complete solution for the SMB, their API is robust and supports more extensibility than other leading tools. I don’t think they have to choose platform or all-in-one here. Overall, I recommend companies start with Hubspot and then add a larger tool such as Marketo if they need a specific feature set that Hubspot lacks. In practice few companies adopt enough features to justify more than what Hubspot offers. We generally agree that many smaller firms should start with HubSpot. I’ve seen a couple of firms buy Marketo, only to fail in its use and switch to Pardot or HubSpot. That’s perfectly fine! What I am saying here is that the size of your firm and the type of marketing you do will influence your choices and HubSpot’s ideal for the VSB that is still developing marketing. The paradigm HubSpot uses is inbound marketing, while Marketo is about demand generation. I’m sure HB is better able to handle SEO and content creation; in fact I say that. The difference is whether or not you have need of a certain type of marketing OR a certain type of system. What I’m hearing most recently is that Hubspot is appealing specifically because there’s a free CRM now connected. For small firms unwilling or unable to afford both, say, Marketo and SFDC, it seems the main point is cost. Has anyone who has experience with Marketo/SFDC also used Hubspot/Hubspot CRM? I’d love to hear how effective these are for sales as well as marketing. Interesting point. That is pretty much what HB wants at the VSB level. I’ve been trying HB CRM and find it’s pretty good for my size of firm. If you look at HB’s fee structure, it doesn’t seem that different from other MAP vendors, in fact it might a lot more expensive for medium sized lists. Anyone have more direct experience with HubSpot?